In the fast-paced world of High Frequency Trading (HFT),lucrative opportunities such as liquidity imbalances and short-term pricing inefficiencies might exist for only a few microseconds. Success depends on identifying and acting on thoseopportunities faster than competitors and that responsibility rests with the trading network. 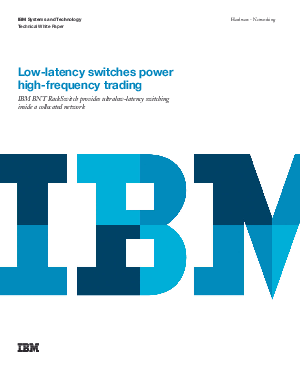 IBM System Networking products support the goal of faster trading. Today, the speed quest for high-frequency trading networks has narrowed to a laser-like focus on latency. Latency measurements that were unachievable just a short time ago are now commonplace. Organisations wishing to take the next step to reducelatency need look no further than their own collocated equipment. With IBM, replacing a traditional router with an ultralow-latency switch can provide a next-generation competitive edge.